32983 PER1126.jpg 500X638\PER1126.jpg 29972 PER1126_1.jpg 500X638\PER1126_1.jpg 29973 zoom4_BroBuckets-2017.jpg 500X638\zoom4_BroBuckets-2017.jpg Send A Hint! 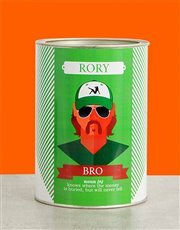 Product Description: less text A real bro is always there for you, so show him some love with this awesome gift! 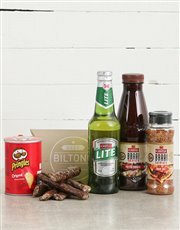 This bucket is branded with a unique 'Bro' label design which is personalised with his name, and inside you can choose from two amazing variants: An alcoholic option which includes Pringles (110g), Aero (85g), Japanese Crackers (100g), Droewors (100g) and Nederburg Baronne (250ml) OR a braai option which includes Castle Marinade,Castle Spice Shaker (200ml), Castle Lite Bottle, Droewors (100g), and Pringles (100g). Either way, this is one gift that is sure to impress any bro! 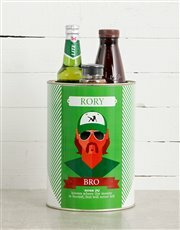 Get this Personalised Bro Bro Bucket delivered with NetFlorist.